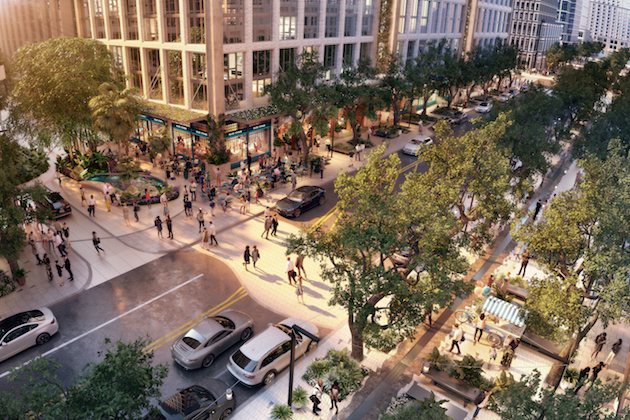 The company tasked with developing the Water Street Tampa district has released its vision for the neighborhood's public spaces. The design by Strategic Property Partners will bring together a variety of buildings with lushly shaded green spaces, shopping and dining, plus cultural, educational, and entertainment spaces. Accessible, open area will encourage everyone to explore the neighborhood together and enjoy the outdoors. Water Street Tampa: Vision for Public Spaces from Water Street Tampa on Vimeo. Water Street Tampa is a 50-acre district at the southeastern end of Downtown Tampa, bounded by Morgan Street, Meridian Street, Walton Street, and Garrison Channel. Currently the district includes Ferg's Live Tampa, plus Amalie Arena, Cotanchobee Fort Brooke Park, and the Tampa Bay History Center at the southern end, on either side of Old Water Street. But the rest of the area was nothing but vacant lots and makeshift arena parking before work began on the Water Street Tampa project. Reveal and improve connections: The district is oriented towards the Tampa waterfront and focused on internal connections (from one building to another in the district) as well as external connections (to the Harbour Island and Channel District neighborhoods nearby). Prioritize pedestrian comfort: Shade and safety features are being improved on streets throughout Water Street Tampa to make it a comfortable environment for everyone. The roads are designed to accommodate cyclists, pedestrians, and transit options as well as vehicles, and sidewalks will be extra wide to encourage foot and bicycle traffic. Lighting and signs will help people navigate the area, and parking garages will allow visitors to leave their car behind and explore the neighborhood on foot or by bicycle. Diversify public spaces: Exactly as the goal says, there will be a variety of gathering spaces in Water Street Tampa. A public plaza will be set up outside the new USF Morsani College of Medicine, while a new park is built at the northern end of the district. The landscaping and greenery, totaling over 30,000 square feet, will be made up of native vegetation including Southern Live Oaks, Bald Cypress, Winged Elm, American Elm trees. To provide an anchor and focal point for the district, Water Street will be extended north past its current end point of Channelside Drive. When completed in 2020, the new Water Street will feature a 45-foot-wide promenade along the eastern side, with landscaping and a double row of mature Live Oak trees. Various water features along the street will provide the constant sight and sound of running water. The entire Water Street Tampa district is being designed to meet LEED Neighborhood Development (ND) certification for energy efficiency and environmental impact. On top of the 650 trees being planted in the area, the infrastructure and soils in the area will work together to handle Florida's notorious tropical rainstorms, and the cooling system for the entire district will be centralized. HVAC units would normally be needed on every individual roof, with no guarantee of energy efficiency. With those efforts centralized, the spaces will be freed up for green roofs and amenities like rooftop patios. With the Water Street Tampa project, the wave of improvements across Downtown Tampa has reached one of its most neglected corners, where not much has happened in decades. (I grew up in Tampa in the 1980s and I can't remember a time when this area wasn't empty and run down.) When the district is completed, residents and visitors alike will enjoy a modern, well thought-out neighborhood with plenty of places to live, work, and play. Want to know more about Tampa business and Tampa real estate? Keep checking out 813area.com. While you're on the site, sign up for free email updates. Then when all these cool new places open in the Water Street Tampa area, you'll be the first to know! Photo provided by Strategic Property Partners and used with permission.